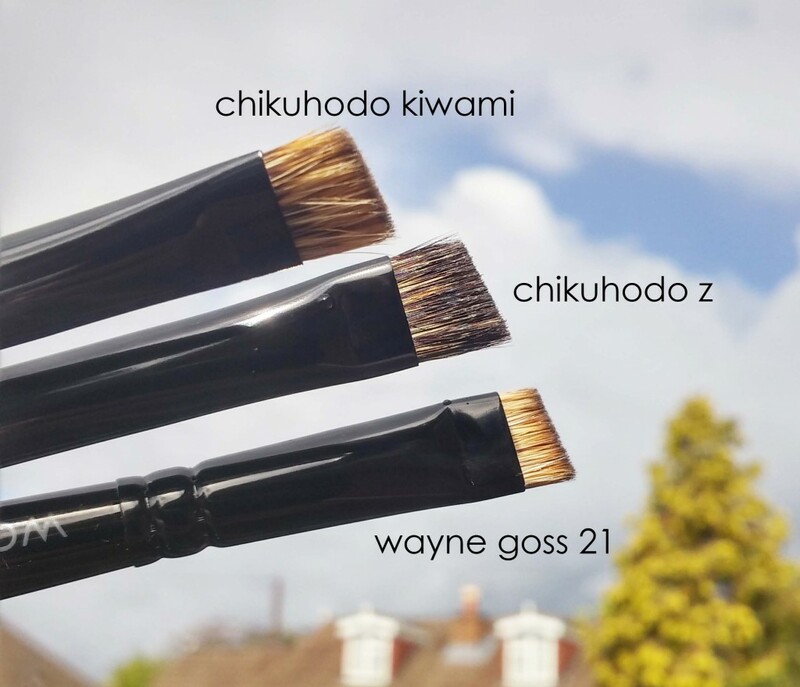 Breaking news in Browland, a set of 3 brushes is being released by the talented Wayne Goss for the most browsessed of us. It launches today 16th of September 2015, 9am PT (12pm New York) on Beautylish.com. I am currently happily hopping on a car trip around GB, I received this set just before I left, just managed to take a few pics and this post is going to be more of a first impressions at this stage. For more info on the set, there is the playback of a past live conf with Beautylish, Wayne and Trisha available for listening here, and also Wayne’s Youtube video here. This brow set comes with 3 brushes, #21 brow, #22 spoolie, #23 double comb. Costs 55$. No plans for an individual release. 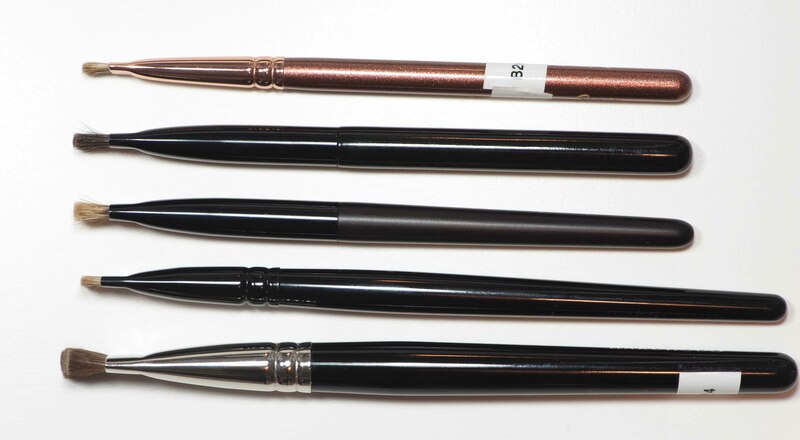 I am currently in the hunt for brow (or liner) brushes that have long and slightly thicker handles, the distance to the mirror is not a problem today and sturdier handles agree better with my big hands. I often say in my posts: “I wish they were longer and thicker”. Dirty me. Medium to long… well balanced with a nice body, not too thin, whenever possible not pink 😀 In Japan they often suppose that people who work or apply make-up love all things pink, not necessarily. 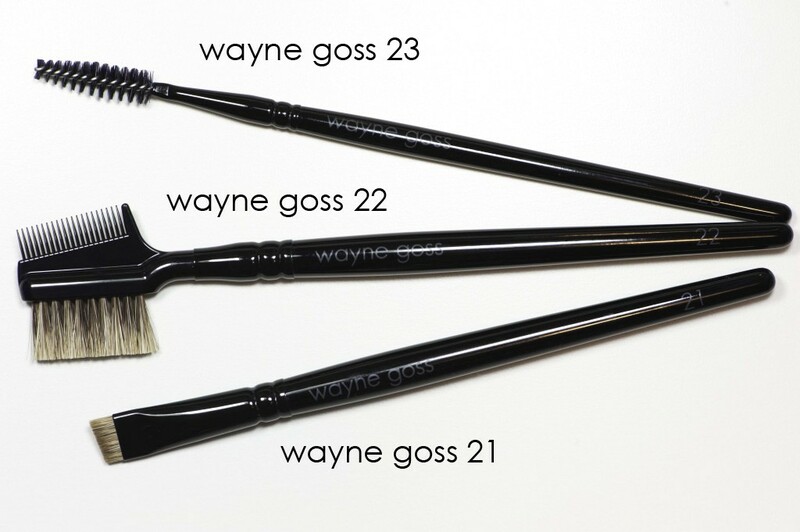 So very first impressions were positive with these Wayne Goss. The total length is 14 cm, base of the ferrule is 1 cm wide, shorter side of hair 0.4 cm and the longest side 0.5 cm. I believe these are water badger bristles. 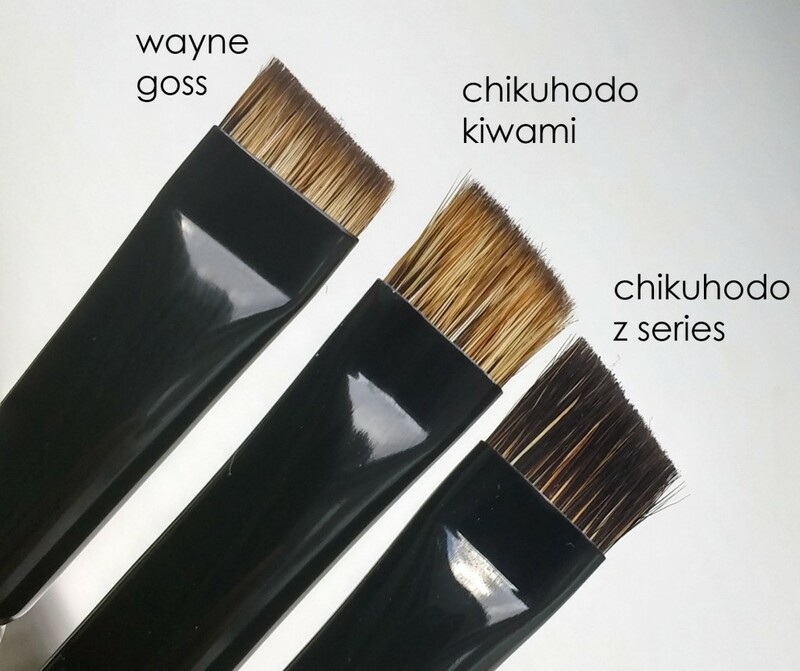 The WG brush is longer than the Chikuhodo Kiwami brow (currently discontinued) or the Z series (Z-6), the WG feels heavier and better balanced to me. In comparison, the hair is obviously shorter and firmer than the Kiwami or Z-6. Here is a close-up picture after they all have been in action, dirty, sorry. 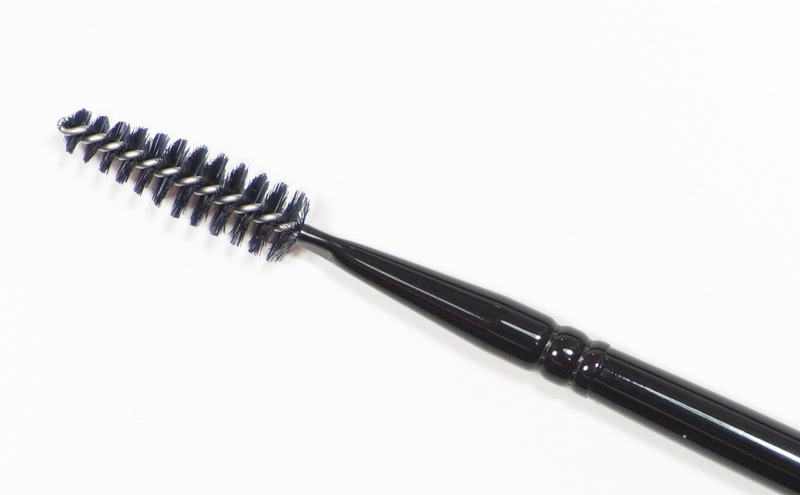 This brow brush is one of the most effortless I have ever used, if not the most effortless. 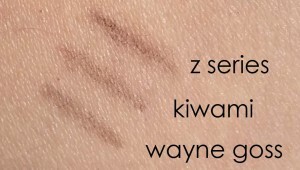 I recommend you watch Wayne’s tutorials if you don’t know how to handle this little brow brush or if you are not used to. I just define the top line of my brows with it, the arch, the bottom line and fill in any bald spots. I use a sheer powder, sheerer than my brows or a cream like the Armani or Lancôme little brow pots. I consider myself lucky as I don’t have a lot of work to do, they are quite well behaved and thick enough so it’s mainly a matter of a little discipline and definition to obtain a clean subtle frame. I did not had the chance to use it on other people yet but it is planned during my holiday trip. I have no doubt it will work amazing with any brow shape or brow product. 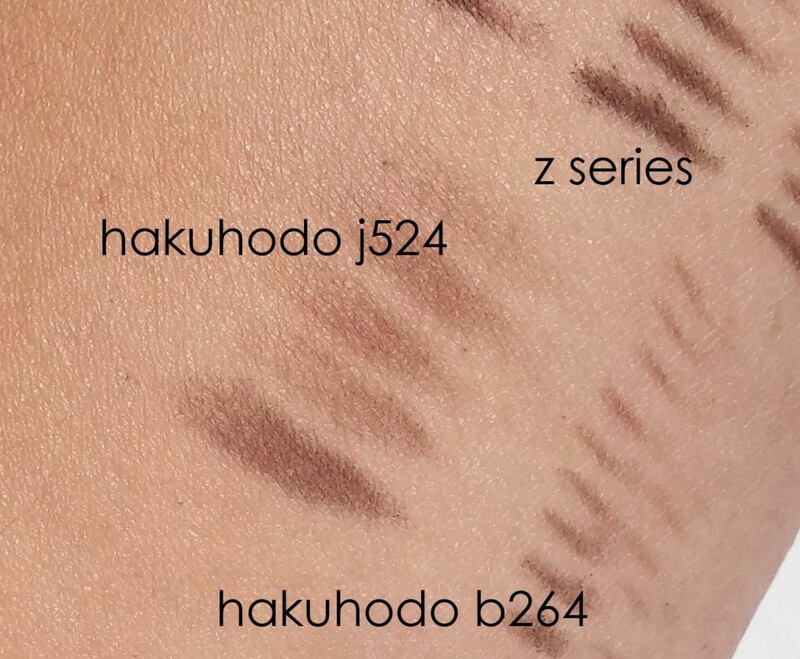 The length of the swatch when you press the tips of the WG 21 perpendicularly against your skin equals 1 cm long and the width is ~1 mm wide, the other two swatches (Kiwami and Z series) result in a less sharp line and even with a careful pressure, the sides bleed a bit. The bristles of the WG 21 are shorter than both the Kiwami and Z series which makes the latter more flexible at the surface, you just don’t get the same sharpness as you do with the WG even though it doesn’t differ that much. When you do notice a clear difference is with the quality of the little strokes. With the same amount of product you can do more with the WG, it takes you longer and the intensity of the strokes is more even from start to finish. With the other two they are more intense at the beginning and fade faster. Conclusion: I can work similarly with the 3 brushes but with the WG 21 I definitely get more control and I go faster. I used it every morning since I got it, super effortless application, never failed me. I strongly believe that the brush’s size is spot on, same comment about its firmness. Versatile with any type of product. Wayne says we can also use it with concealer just to clean up around the brows (drawing a line). 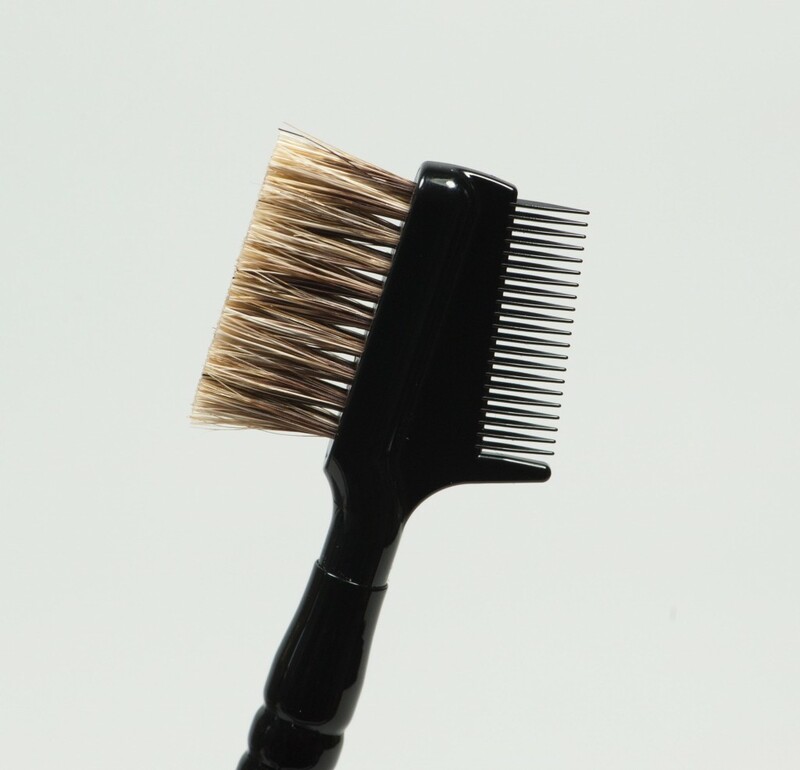 Total length of the brush is 15.5 cm, the comb bristles are 2.5 cm wide and 1.2 cm long (I believe these are horse bristles), the plastic comb is 2.3 cm wide and the teeth 0.7 cm deep. The surface of the plastic comb is straight, in most cases they are curved. The teeth are very pointy and more spaced than the Koyudo. 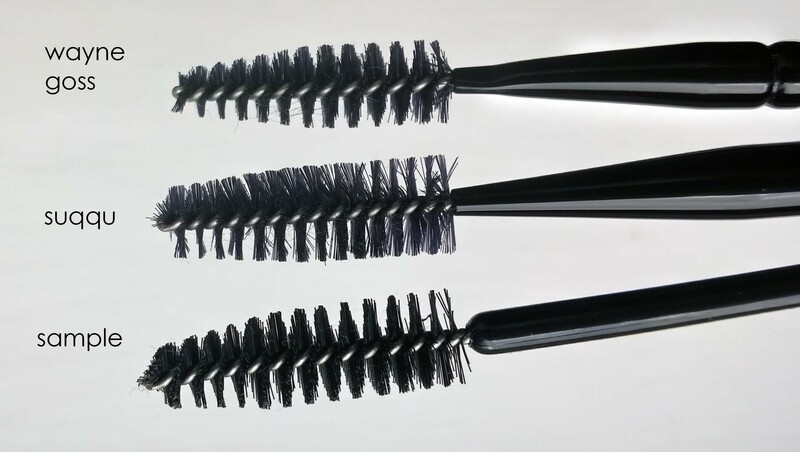 The fact the teeth are more spaced facilitates the application of mascara, when some combs would more “push” than “comb” your lashes, this will do a better individual job, working in between the lashes. Wayne recommends to transfer some mascara product onto the teeth and then comb your lashes with it. Ok, this is not a technique for me because it takes me too long, the result is definitely stunning, my lashes look longer because there is product at the very root and til the very top and they look more separated but mascara application has to be quick and easy and this technique is too time consuming for me. It achieves spectacular results, but it’s not something I would do on a regular basis. Even applying more than two layers of mascara is something I will not take the time to do. Primer and mascara and that’s it. That’s the reason why I love lash extensions so much, no mascara required, the down side of this is that after a few months of wear, lashes are gone to baby size, I noticed the longer you keep your lash extensions, the worse it gets. Today I have no visible lashes unless I apply hips of mascara and liner to distract from the lack of lashes. I will not use lash extensions in the near future. For the second day in a row, I did one eye with the comb and one with mascara, two coats, results are better with the comb but I can’t bother do that on a daily basis. I should but I just don’t have the patience. Where I see a potential benefit is when combining two mascaras, or if I want to add little sparkle effects into the mix to go on the top of my lashes, I will use this comb to transfer them. For now, due to the size of my lashes, that’s not even a question, I have to wait until they grow to their original size. It’s similar to the Koyudo, the Koyudo is just slightly wider at the surface but it may be due to the intense usage as it has a few years already. 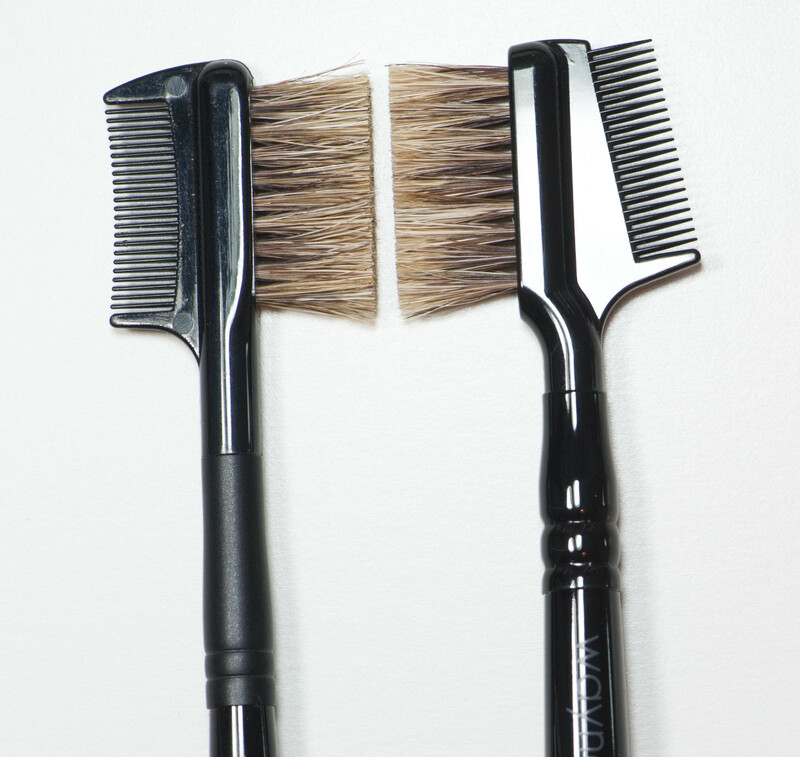 You can use the comb to perfect the finish of your brow application, by buffing or toning down the intensity. With the WG 21 brush, I do not really need to perform any correction. The more you buff, the sheerer it gets. Same with cream, the more you polish, the sheerer it gets. Conclusion: this comb is not a necessity but depending on your game, you will find great use out of it. I am thinking specially of men, if you want to wear mascara that intensifies your look but is invisible to eye, or if you just want to target the application on some of them, using the little teeth allows more control on that. In terms of quality, the WG is fantastic, also the straight lines makes it look more grown up. 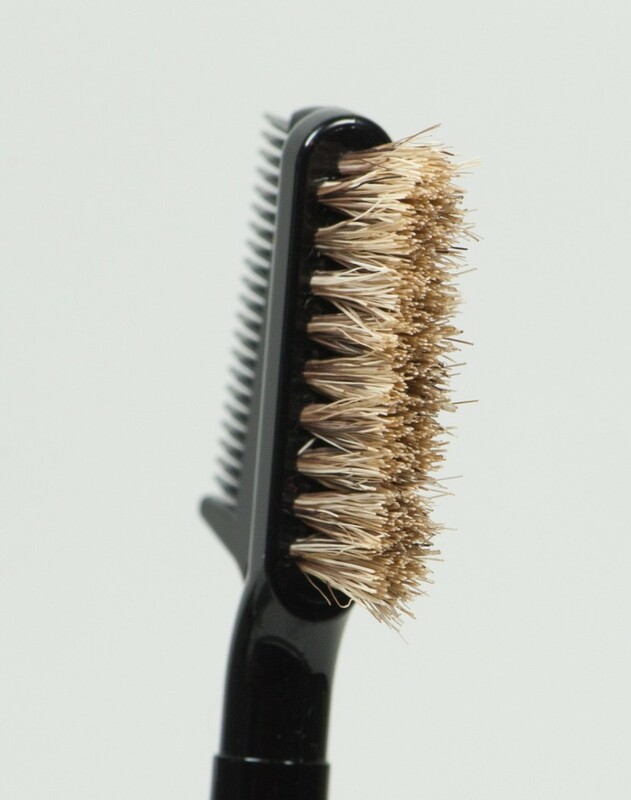 The surface of the bristles is approx 0.3-0.4 cm wide. The total length is 15.5 cm and the spoolie head is 2.5 cm long. The Suqqu shown here is a gift with purchase I was lucky to get a few years ago. In comparison, the WG 23 bristles feel firmer. I find the Suqqu good enough and very soft but sometimes it’s just too soft and dense to fit the purpose, I wish it was firmer in order to put more pressure on it, especially when I wear lash extensions as I need more space between the spoolie curls and less density to separate them more easily. When I sleep with lash extensions, the next morning they have a life of their own and need realignment, the curled bristles of the Suqqu spoolie are too dense to allow efficient combing and separation of the lashes. I forgot to take the Dior spoolie but I have that one and it was my go to. 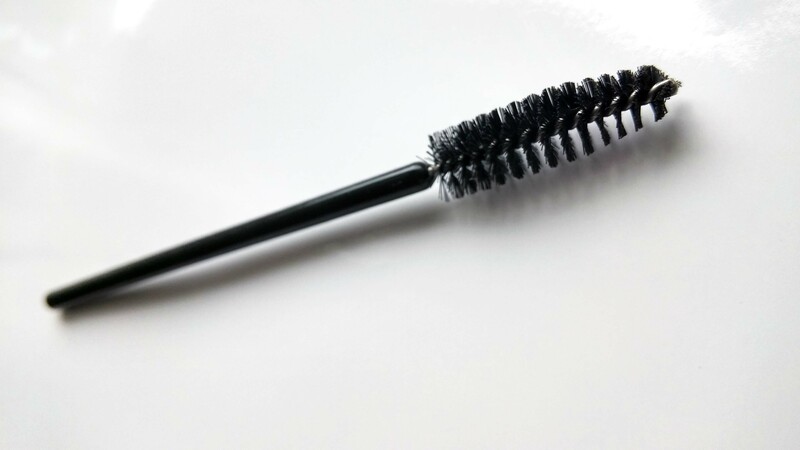 I use it for disciplining the brows and combing the lashes, when using lash extensions or false lashes this tool becomes your Best Friend Forever. So then why not just get a little sample spoolie and live happily forever after? That is totally fine, but for the purpose of the review I have a few comments about that. Longer handles are sometimes better to work on a client, more steady and less risks to poke their eyes with (it’s my case). Shorter handles are better if you have to go close to a mirror, but those are used sideways so imho no really need of shorter handles for these. 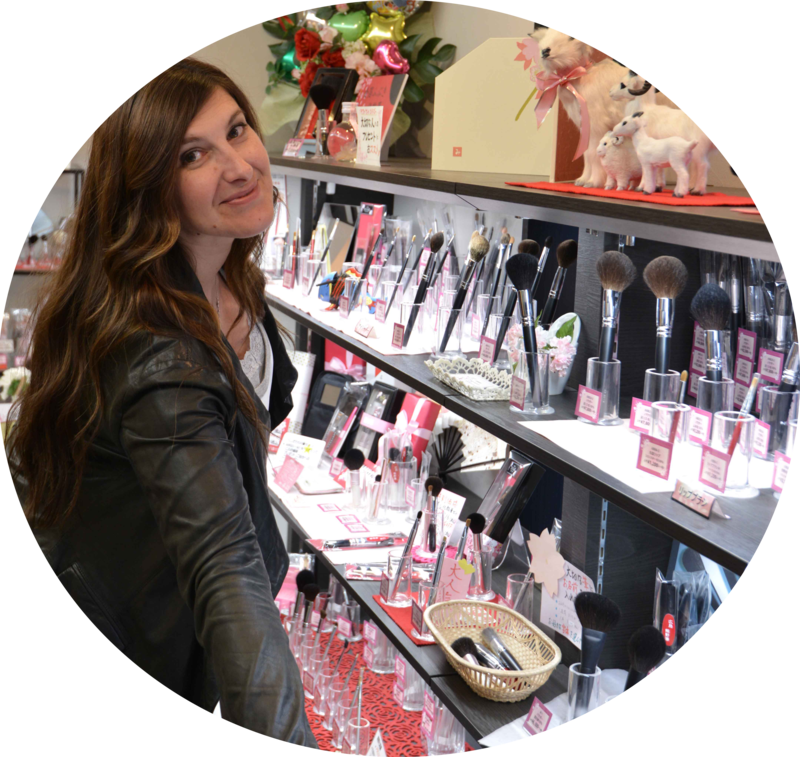 Just like the full-size spoolies, little sample ones have to be sanitized and dust-free. That’s very important as it goes so close to the eyes. If you use the ones standing on the counters, people may have been sneezing or coughing around them, or they may be covered with dust. When I get my make-up done at the counters in Switzerland, everytime they do my lashes I end up with an eye infection or a very bad irritation, now I just tell them not to use their mascaras or spoolies or anything in my lashes or waterline. I have extremely sensitive skin and sensitive eyes so that often ends in red eyes. 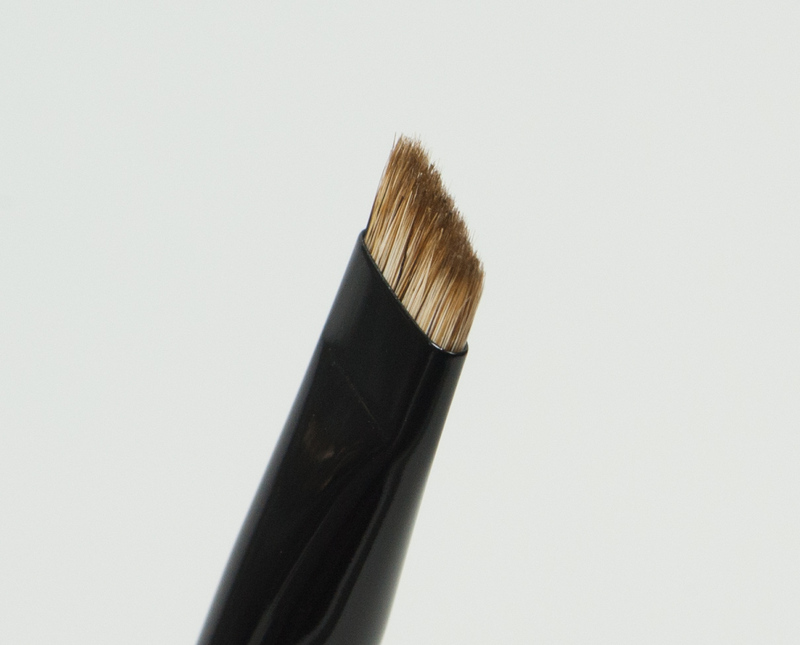 When you are just starting to collect or upgrade your make-up brushes, a spoolie and a comb are not the priority, you can get the job done with cheaper alternatives, however, a great brow brush is a necessity both for personal and professional use. 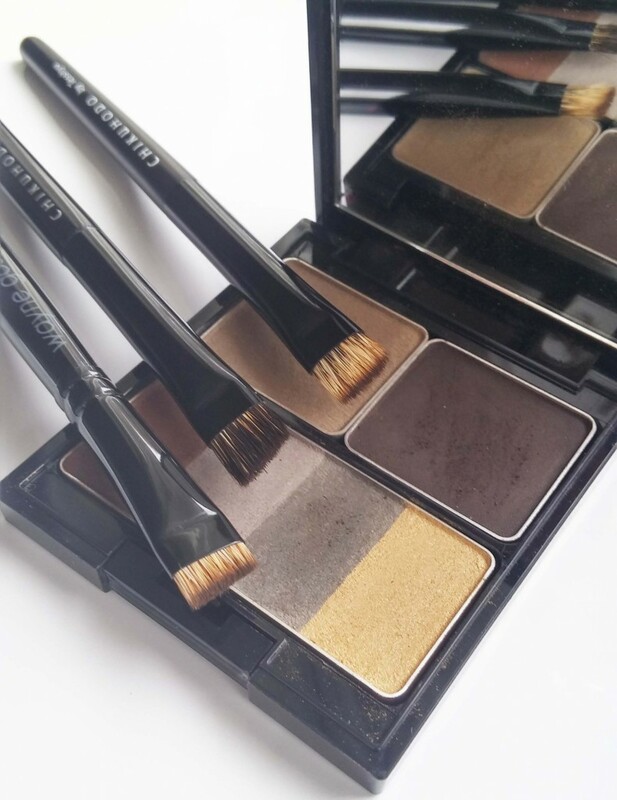 The results you can achieve with this set are truly mind-blowing, it will transform anyone into a brow professional, doesn’t get any better, even with more expensive tools. I don’t often travel with a double sided brush comb but I do travel always with a spoolie and a brow brush (or two), having a set will remind me to grab the others, I use them on a daily basis but I often forget to pack them. Actually, I am just realizing that the first brush that I reach for when I travel is a blender! Without blending we aren’t going anywhere, literally! This set is 55$ and is available at Beautylish.com, I got mine as a present but I will get a second one for my kit. 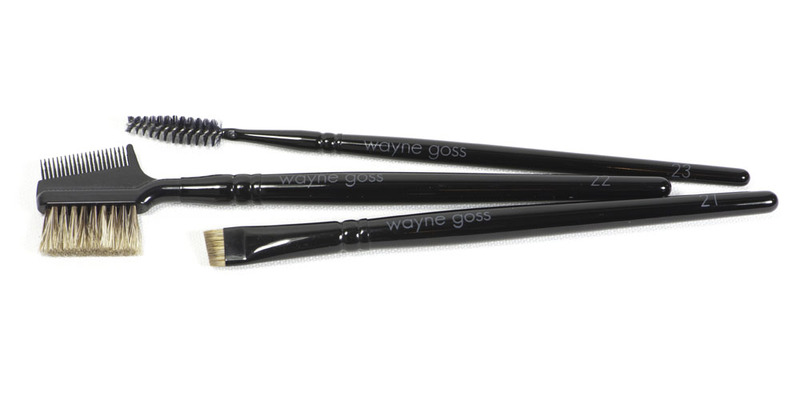 WAYNE GOSS – The Brow Set was last modified: October 19th, 2015 by Sonia G.
My order shipped out yesterday! I’m pretty excited about it. I am truly brow obsessed. You have no idea how many brow products and palettes I have, lol … but seriously, his brushes are elegant and classy by design. I have similar brushes made with the same hair, but what makes his stand out 1) is the shortness of the angle brush (21). I love that. The only other 2 brushes I have that I have that are close to the comb (22) brush, one is a MAC, with synthetic hair and the other is my Kyuerido KK-009 (but I tend to baby this one so it is only used on special occasions … hehe). 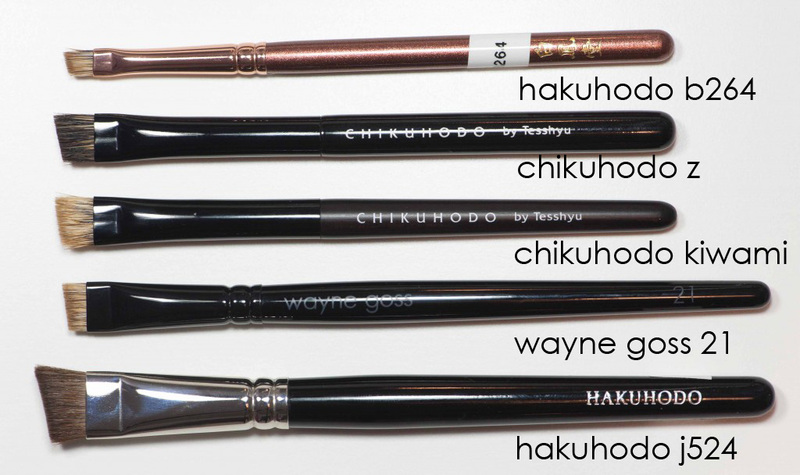 And spoolies, I have them in every bathroom (MAC), I’ve managed to get my husband to use them to groom his brows, he has nice thick purtyful ones 😀 … and I keep my Chikuhodo GSN spoolies with my everyday kit, but again, they are too long, so I love the length of Wayne Goss’s brushes, because they are easier for me to use when I travel. Gracias Sonia por subir tu primeras impresiones tan rápido! Un beso desde Toronto! Te cuidas. XOXO! After reading that I was sold, because the only thing I can think about it now is: How awesome is that?! Thank you for this great first impression review! Thank you so much for such a detailed review of this brush set. My set is currently in the mail and this review made me even more excited! Great comparisons. This is my first time to hear and see about this brand and I am impressed! 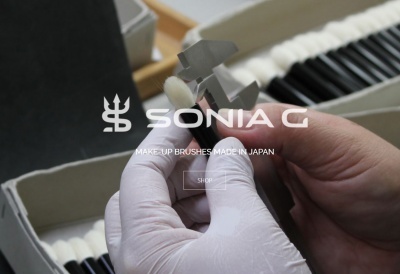 Well, I think this is something worth checking out if you are finding a good brow set.